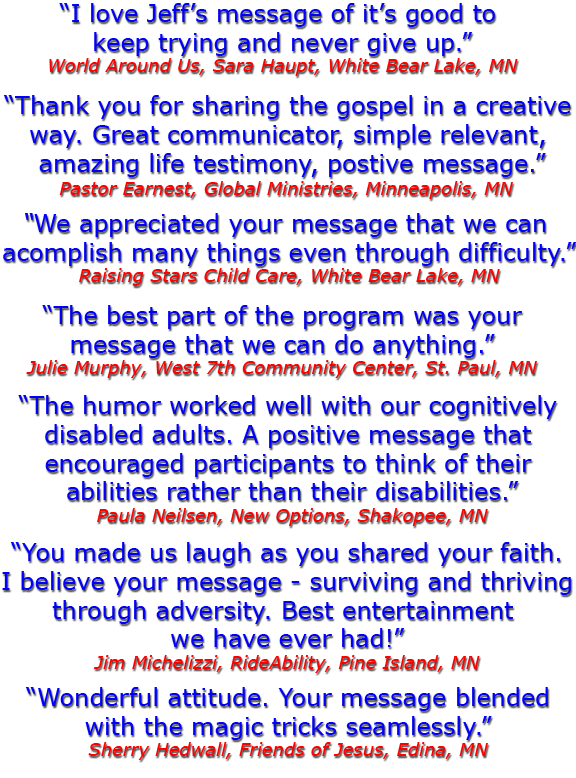 Jeffery Smith brings a dynamic motivational presentation for your corporate, civic or non-profit group. The inspirational message of overcoming challenges while keeping a positive attitude delivers, not only an encouragement to your group, but also offers practical principles for everyday success. His infectious positive attitude illustrates how to thrive in difficult situations, through a variety of humor and heart touching stories. 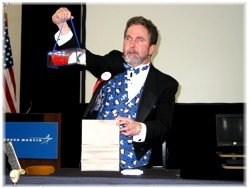 Your group will enjoy this magical motivational presentation. 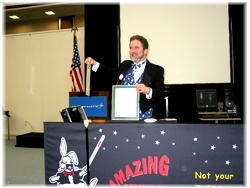 Your Group will be AMAZED by Jeff Smith ~ The Amazing Jeffo! Smith Demonstrates the Power of a New Perspective! "A man who lives up to his title - Amazing! Amazing Jeffo is a man who doesn't know the word can’t." Discover ways to be free from self-limiting attitudes. Your group will gain new perspectives about their own abilities to overcome challenges as they witness how Smith creatively uses adaptive skills and techniques. Invite Jeff Smith to share his unique perspective with your corporate or civic group. Ignite a new attitude. It’s encouraging, inspirational and fun! "This is not a story about a man who cannot see. It is a story about a man who refuses to see the obstacles in front of him." The Amazing Jeffo Will Reveal the Secrets! It’s Inspirational, Motivational. It’s Jeff Smith! "His warmth and sense of humor help to underscore the real message, that you can overcome adversity." "There’s more to the Amazing Jeffo’s program than meets the eye. His best trick is making misconceptions about disabilities disappear." "Your showmanship, message and presence helped make our Manager/Supervisor meeting a fine success." "As both Jeff Smith and my alter-ego Amazing Jeffo, I will share my unique life perspective to encourage and motivate your group to excel and rise above challenges." Who’s ever heard of a blind magician? Doctors said he wouldn’t live past the age of 15: Jeff is over 50. Some teachers said his disability made college impossible: Jeff is a University of Minnesota alumnus, the first blind individual to graduate from the School of Journalism. They said advertising copywriting had never been done by someone blind.I graduated with a major in advertising copywriting and worked in an agency and as a free-lance copywriter. Family and friends feared he'd never live independently, much less marry: After years of living on his own, Jeffo built his own home in 2002 and just celebrated his second wedding anniversary with his wife, Devon. Friends worried he'd not be able to find work as a blind entertainer and motivational speaker: Today, Jeffo makes his living entertaining and educating thousands, performing 150 shows annually. 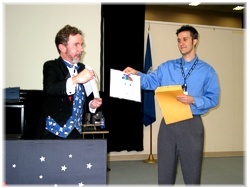 In his role as a magician with a message, Jeff Smith often says, "I’m a magician who happens to be blind." This declaration says more than it first appears to say. Amazing Jeffo sees himself foremost as a magician\motivational speaker, who merely possesses the characteristic of being blind. Smith doesn’t view his blindness as a disability, but as a means to express his belief that "the most disabling thing in our lives is the thing we can do the most about: our attitude." "The most valuable lesson I learned from Jeffo’s show was from my son Ben, who afterward told his brother at home everything about Jeffo, jokes, magic, harmonica playing, everything except that Jeffo is blind," says John Alexander, director of operations for Kaposia, Inc. "Ben didn't care Jeffo was blind. Ben just thought he was funny and could do tricks. Ben didn't see Jeffo as a blind magician\comedian\inspirational speaker. Ben just saw Amazing Jeffo for who he was." Using magic, music and comedy, Smith takes on obstacles and uses them as opportunities to create new life perspectives. Audience members’ eyes open and stereotypes are dispelled. Attitudes are refreshed and transformed. "We cannot control our circumstances, but we have total power over how we interpret these circumstances and what we do with them," Smith says. "We can dwell on negatives or realize that all circumstances have inherent negatives and positives. We make the choice." Smith often uses humor to describe his most daunting challenges, i.e. "A Funny Thing Happened on the Way to my Blindness" and "The Hilarity of my Hospitalization." A healthy dose of humor has accompanied each of Smith’s physical challenges, proving as great a medicine as any prescription or treatment. "I can either see blindness and other physical challenges for the ways they may limit me, or choose to see them for the opportunities they create," he says. "For example, giving me the opportunity to teach others about their challenges, which are really just opportunities in disguise. My circumstances have enabled me to reach beyond myself and more clearly see the influence I can have in the lives of others." Smith’s audience members are encouraged to free themselves from their own self-limitations. 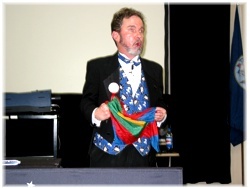 They gain new perspectives about their own abilities while they witness how Smith creatively uses adaptive skills and techniques in his presentation. Invite Jeff Smith to share his unique perspective with your corporate or civic group. Ignite a new attitude. As Smith says, "Discover the opportunity that lies in the midst of the obstacle!"